The tabletop wargame has fought a long battle for redemption. For a complex game, the appeal of Warhammer is simple. First, you and a friend paint up some armies. Then you spend an afternoon moving units and rolling dice to create a dynamic diorama that shifts turn by turn, as you fire off spells, make charges, and wage miniature fantasy war. Some players enjoy the competitive aspect and write killer lists, others like to throw down thematic forces and let the dice create a story. For anyone who collects, the unifying element is the models themselves. The game system has changed dramatically since the days of Warhammer Fantasy Battle, and armies have come and gone (RIP Tomb Kings), but Games Workshop still make the coolest game pieces in the world. Three years ago Games Workshop replaced Fantasy Battle with the Age of Sigmar. The old game—a dark fantasy take on medieval warfare—disappeared, replaced by a scenario-driven high fantasy skirmish game on round bases. The tone also shifted. Spearmen in jerkins and knight cavalry were replaced by teleporting golden lightning men called the Stormcast Eternals, and the old world exploded, to be replaced by eight planes of existence called the Mortal Realms. It was a brutal shift for long-term collectors, but players who have stuck with AoS have seen it gradually flourish from a simplistic gold team vs. evil red team clash into a rich universe where four grand alliances—Order, Chaos, Destruction, and Death—battle for territory, and each other’s souls. The factions have become stranger, the model design has grown bolder, and the addition of structured competitive play has enabled a thriving tournament community. A few weeks ago Age of Sigmar’s second edition launched with a huge new Soul Wars set that pits Stormcast wizards against a Nighthaunt ghost army. The box includes a 320-page hardback core book, 52 models, dice, a ruler, unit cards, as well as assembly instructions, a quick-reference rulebook and the first chapter of the new Soul Wars novel. Beyond the box, GW also released a new magic system called Malign Sorcery, and the latest edition of the General’s Handbook, which sets unit points costs and scenarios for competitive play. The core book’s exceptional artwork and detailed fiction timeline outline a universe that’s worth your time and imagination. For Age of Sigmar players the new core book especially is a coming-of-age moment for the game. In the beginning the Mortal Realms felt like a vast and nebulous setting where anything could happen, and nothing especially mattered. Now the realms are mapped out and described, both in the huge world-building segment of the core book and in realm specific rules. Arrows catch fire in the realm of fire, giving long-range shots extra armour penetration. The weight of armour in the realm of metal slows down Stormcast Eternal knights with their sturdy armour saves. The book is full of these evocative notes designed to create a cinematic minds-eye sense of the battle unfolding. It seems pointless to analyse the ruleset removed from the fictional context because for most players the two are entwined. The core book’s exceptional artwork and detailed fiction timeline outline a universe that’s worth your time and imagination, and it’s a solid bedrock for player-created campaigns and scenarios. The game itself has been tightened up but not significantly rewritten. This is good news because the original four-page Age of Sigmar ruleset simplified Warhammer into a faster, less fiddly game. The core ruleset and individual unit rules (known as ‘warscrolls’) are freely available online, so you can find more detailed specifics there. Essentially a game consists of five a battle rounds, and in each battle round both players get a turn. A turn consists of multiple phases. In the hero phase you cast spells and spend command points to use leaders’ command abilities, then you move the units you want to, then you shoot with any models that have a shooting attack, roll for charges, resolve combat, and then roll in the battleshock phase to see whether any models run away. Unit warscrolls define a unit’s speed in inches, as well as the dice rolls you need to make to attack or defend successfully. The humble six-sided dice rules Age of Sigmar’s universe. A shooting or melee attack involves a roll to hit, a roll to wound, and if the opponent has armour a roll to save from the other player. A spate of bad rolls can tilt a game dramatically, which can be great for storytelling, but tough for competitive play. Sometimes you’ll just whiff a vital charge roll or two and lose out on a winning chance. Good players build consistency into their lists and use movement to maximise their opportunities. It’s quite possible to lose a game of Age of Sigmar but know that you played it well. Age of Sigmar is defined by its infamous double-turn mechanic. At the end of a battle round, once you and your opponent have taken a turn, you roll against each other for the choice to start the next battle round. This means a player can go second in the first battle round, win the turn roll, and then choose to go first in the second battle round, effectively giving them two turns in a row. This can feel arbitrary and cruel when you’re new to the game, but it’s the source of a lot of AoS’s most interesting tactical dilemmas. The possibility of a double turn might change your decisions significantly, and it forces you to consider a lot of different potential board states than a typical ‘you go, I go’ turn sequence. The player who finishes deploying first gets to choose the first turn, so you can build an army with fewer deployment drops to give yourself the option of moving first, or delaying for the chance of a double turn. One of the new scenarios gives you extra points for capturing on the second turn in a battle round, creating even more interesting decisions. Tournaments are a great way to see a variety of armies, but it's worth learning to play fast before you attend one. Sending a vampire lord on zombie dragon to take on the entire left flank. Good luck, Vlad. A Fyreslayer general astride flaming salamander can take on plain old skellies, right? Nope. Age of Sigmar is a game about managing luck and the turn, to an extent, but more importantly it’s about movement and objective capture. Scenarios typically ask you to capture points by moving units (or heroes, in some scenarios) within 6” of the objective. I have seen players wipe out the opposing army entirely but still lose on objective points because they didn’t focus enough on scoring. Different scenarios vary the number and distribution of objective points and draw different deployment zones. The scenarios are vital. A field battle without objectives turns into a total dice-off, and the game becomes more of a statistical exercise about maximising damage output rather than a wargame about outmanoeuvring your opponent. I’ve played through a year-long narrative campaign and been to a couple of tournaments, and I’m impressed by how AoS adapts to both styles. Having said that at the time of writing the competitive game is in a very raw state after the rules update—a notorious magic frog called Lord Kroak can blow up entire armies and it’s possible to stack command abilities on units in very silly ways. 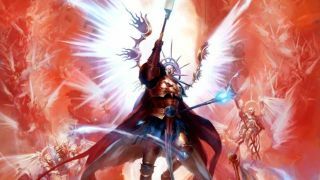 Games Workshop has consistently released FAQ rules updates to fix egregious combos but the tournament scene is going to be rough for a while as players discover combinations. Age of Sigmar’s complexity lies in the sheer number of unit warscrolls, and their crisscrossing effects can create brutal unintended outcomes. The beauty of Warhammer is that it’s not just a game. It’s a way to exercise your imagination, it’s an excuse to hang out, and it’s a creative hobby that may result in you owning boxes full of crafting bits and tiny pots of paint. For anyone who enjoys the meditative act of slopping a wash over a base colour the Soul Wars box is mostly brilliant, though there are a few minor problems. The models are push-fit, which means you can clip the components off the sprue and shove them together without glue. In practice, however, this results in gaps that need filling with putty, especially because the Stormcast joins are positioned right down the middle of their shoulder-pads—the most glaringly visible part of the model. The Nighthaunt spirits are better, and both armies are beautifully concepted. The Stormcast general’s mount is unfortunately missing his tummy, which is visible from a few angles if you’re picking him up to have a look, and there are some janky under-arm segments on the Stormcast infantry, but otherwise the sculpts are excellent, and the Nighthaunt in particular are a great starter force for completely new players. Spray them white, wash them green, and you’re good. The new Sacrosanct infantry are some of the best Stormcast Eternals yet, but you might need some greenstuff putty to cover the cracks in the core set units. If you’re interested in competitive matched play, the box gives you a very odd unit of models. You get three paladin Evocators when in matched play you take them in lots of five. You get eight Sequitor infantry models, but you run them in multiples of five in matched play. You get four grimghast reapers but matched play wants them in multiples of ten. However, Soul Wars is designed to be a mammoth hobby project and a grand introduction to the Warhammer universe rather than a matched play starter kit. It's a pricey outlay, particularly if you include the need for paints, but if you buy from secondary retailers like Firestorm or Element Games you consistently get about 20 percent off GW prices. In the world of plastic toys Soul Wars ends up being comparable to a medium-sized LEGO set, and for the artistry of the sculpts and the quality of the core book that's a favourable comparison. There are also some smaller boxes coming for completely new players, and if you just want to try painting something the 'easy to build' sculpts are superb. It's a good time to be an Age of Sigmar player. The Mortal Realms are starting to form into a more serious setting, the books are getting bigger and better, and there are still huge chunks of the range waiting to get an Age of Sigmar refresh. It still can't match the history and dense charactisation of the armies of the old world, but that takes time, and the game is on a good trajectory. With a community site, regular weekly Twitch streams, and regular rules FAQs, in recent years Warhammer finally has the sort of online presence you would expect from an entertainment product in 2018. With all this backing Age of Sigmar feels like it's going to grow and grow in the next decade. Why not get in early?